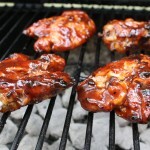 Barbecue chicken thighs are one of the easiest things to make flavorful on the barbecue without a lot of effort. If you don’t pay attention to your grill though, you can very easily char the outside, dry the meat out by overcooking or even worse–both! 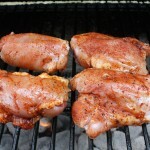 By following these simple instructions it is very easy to make delicious Chicken thighs, wings or legs on the barbecue. 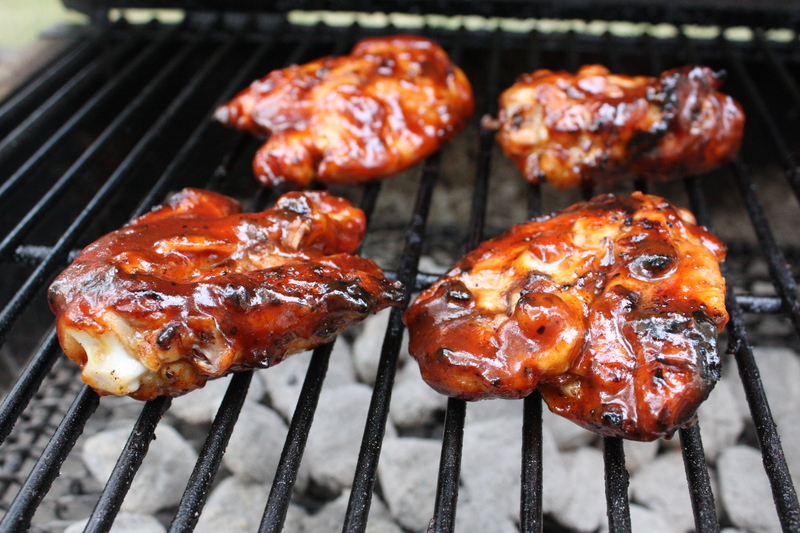 When barbecuing chicken this is one of those times when we are VERY serious about the fact that you shouldn’t walk away from your grill–even before you put on the barbecue sauce. Chicken can go from grilling perfectly to being charred in a heartbeat. Well, maybe not a heartbeat but it is important to stay close by. Barbecue sauce has a bit of sugar. When sugar and fire meet, it is critical to pay close attention to the grilling process. If sugar is exposed too long or to too much direct heat it will char easily if you aren’t careful. 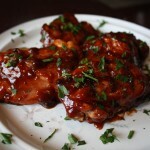 This is why the trick is to add barbecue sauce at the end of cooking it. If it is done correctly it coats the chicken perfectly. So stay close to your grill and pay attention to flare ups. 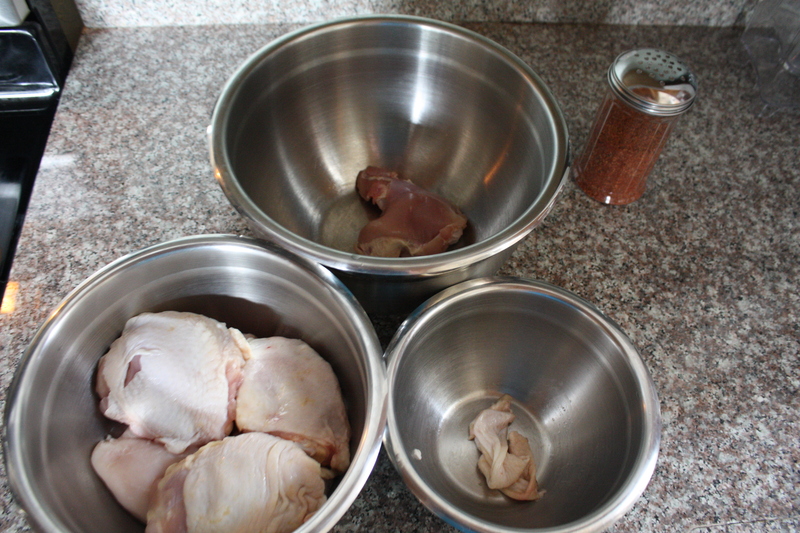 You can also cook your chicken thighs with the skin on if you prefer, but we remove because it is more healthy and if cooked correctly the chicken thighs are just as tasty without it. If you do decide to leave the skin on, it is easier to have more flare-ups as the fat drips into the fire more. Also if you are cooking boneless items, keep a close eye on temperature. It will cook more quickly. Bottle of Favorite Barbecue Sauce (Only need half to two-thirds a bottle depending on how much sauce you prefer). Start coals if using charcoal grill or start gas grill to warm up. 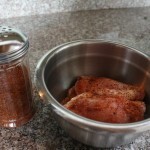 Remove skin from chicken thighs & apply barbecue rub (See video for detailed instruction on How to remove Chicken Skin and apply barbecue rub the easiest way). Set platter aside to bring chicken out to the barbecue. Once coals are ready or gas grill is heated up, properly clean & oil your grill. This is a CRITICAL step when grilling anything but with chicken it can stick very easily so it is important to do this right. Over medium barbecue temperature, place the chicken on grill over direct heat. Immediately close the lid of the barbecue to prevent flare-ups. If flare-ups occur and shutting down the vents to control the fire don’t immediately help, move chicken to a cooler location on the grill before it chars. 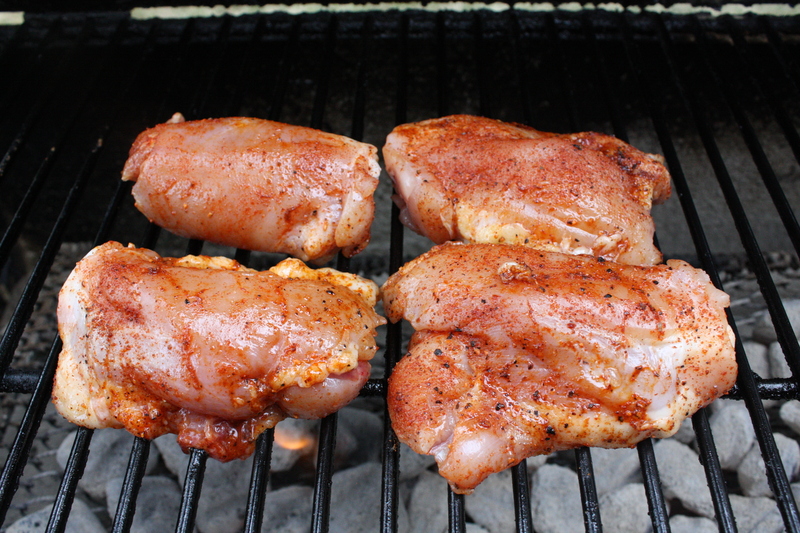 After 6-8 minutes chicken thighs should have some nice grill marks. Flip chicken over and continue to cook for another 6-8 minutes. Check internal temperature of the meat with a meat thermometer. Once meat reaches 155 it is time to apply your barbecue sauce. If it is not to 155 yet, as you cook it longer you may need to flip again to prevent charring on one side or the other. 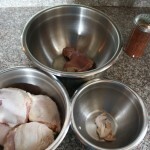 Have a bowl large enough to fit all chicken in it ready by the grill and have your bottle of barbecue sauce as well. 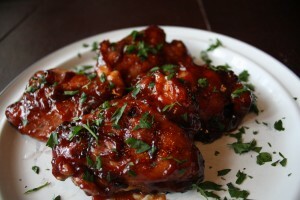 Remove chicken from grill and place in the bowl and thickly coated with the barbecue sauce. If you are great at flipping items in a bowl without using utensils, do it. If you have to use tongs or a spatula just make sure not to pull apart the pieces of chicken when grabbing them with tongs. Also if you don’t have a bowl large enough you can always just do in batches in the bowl. 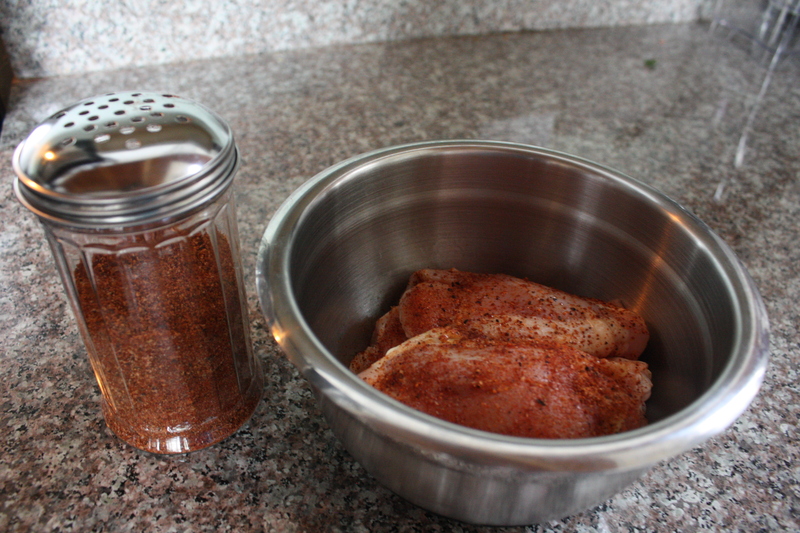 Once chicken is coated place chicken thighs back on grill over direct heat. This is where it is critical to keep a closer eye. 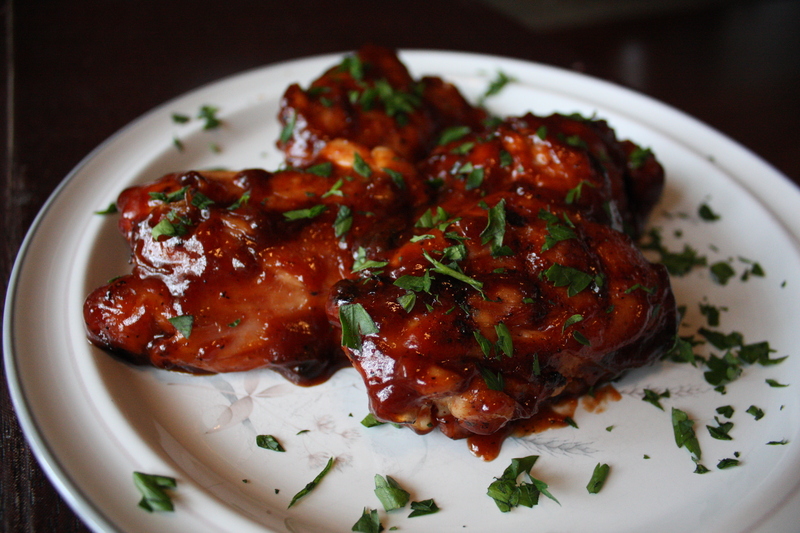 Barbecue sauce dripping into the fire can cause flames quickly. Move the pieces quickly if they flare up to a cooler location on the barbecue. Flip after 1 1/2-2 minutes per side. NOTE: FDA and USDA recommend internal temperature of chicken thighs register at 165 before serving. Chicken will continue to warm up a few degrees after removing from the grill as long as you do not cut immediately into the chicken. Remove chicken from barbecue and toss one more time in additional barbecue sauce. Cover chicken with foil and let rest for 5 minutes. Optional: Sprinkle with some minced parsley for presentation.